There are several transportation options to reach the location. It can be minibus or motorcycle. The distance from Raden Intan (Beranti) airport , Lampung, is about 80 kilometers. Because of road conditions, it took 4.5 hours to get there. The route begins from Kotaagung, through Pringsewu District and Pesawaran. It’s a little boring at the beginning. However, once entering the District of Padangcermin, Pesawaran,the atmosphere changes to fresh and comfortable. Natural mountain breeze brings cool wind and beautiful natural scenery. The Lane roads that cut through the hills on the west coast of Sumatra presents both the views and the sensation of driving. It’s good choice to stop for a while when you reached the highest point to enjoy the beautiful landscapes. All those challenges are paid off once you arrived at Pekon Kiluan Negeri. Being in the middle of the village seemed to be on the island of Bali. It’s because most of the people in that village are derived from the Balinese. Even the head of village residents are the descendants of Balinese named Sukrasana. The local residents will be very happy to welcome visitors and explain the interesting objects. 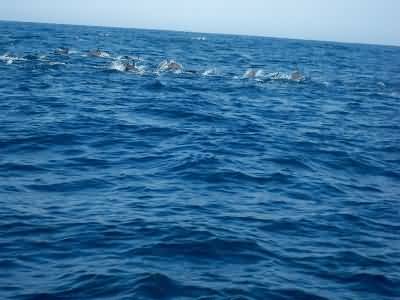 One of them, is various sizes of dolphins,hundreds of them, which can be viewed directly while swimming in the sea. The best time to watch the dolphins live parade in their natural habitat is in the morning. Usually the cute marine mammals appear at about 08:0 AM. Travel by motorboat to the sea is usually started around 06:00. When the weather is fine weather and the sea is calm, tourists can watch hundreds of dolphins swim in groups and jump in the sea. 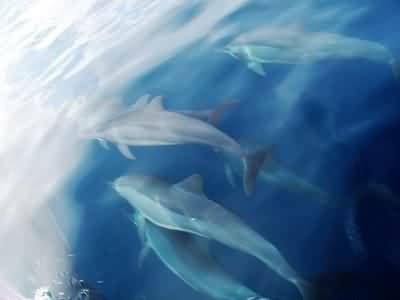 With the weather condition like that, these dolphins usually swim near the boat. Sometimes they even swim around the boat. The existence of Gulf Kiluan can not be separated from historical narratives of Raden Wijaya Anta. According to local belief, Raden Wijaya Anta was known for his bravery. But many of his relatives hated him and tried to kill him. Therefore, Raden Wijaya Anta ask those relatives who wanted to kill him to bring hi to the island which now named Island Kiluan. Because, he could only be killed on that island. Finally, Raden Wijaya Anta was murdered on the island. The request, which is called ‘Killuan’ in the language of coastal area of Lampung was what finally became the name of the gulf.